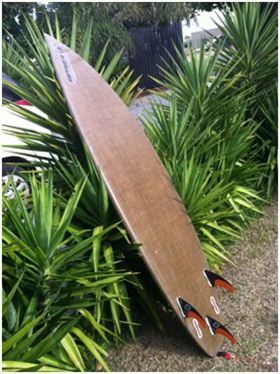 The Samsara surfboard uses Composites Evolution’s Biotex flax fabric. Samsara, based in Victoria, Australia, uses the latest materials to create the most environmentally friendly boards it can. All the materials it uses are sustainable and the boards are either precision machined or hand-made. According to Samsara, carbon fibre is currently the surfing industry standard reinforcement for stringerless boards. “Biotex can be used in the same way as fibreglass or carbon fibre allowing us to do a wet lay-up directly onto the board, which meant we didn’t have to change the process," reports Jason Wiggers, owner of Samsara Surf. Under test, the flax surfboard is reported to perform very well. "The new design gives you more return in high energy from the board through rapid spring back, so when you do a turn the board is flexing under tension and when you exit the turn the energy is released back to you resulting in ultimate speed,” says Wiggers. Samsara now plans to do a run of production boards featuring the flax fibre. It will also be running a competition to find a test rider to sponsor, who will assist with honing the design. Samsara will also experiment with different surfacing textiles to work with the Biotex. “We are delighted to be working with Samsara because they have a real passion for sustainability and are pushing the boundaries in green surfboard manufacturing," says Brendon Weager, Managing Director of Composites Evolution, Chesterfield, UK. Composites Evolution has introduced a hybrid composite tooling system.